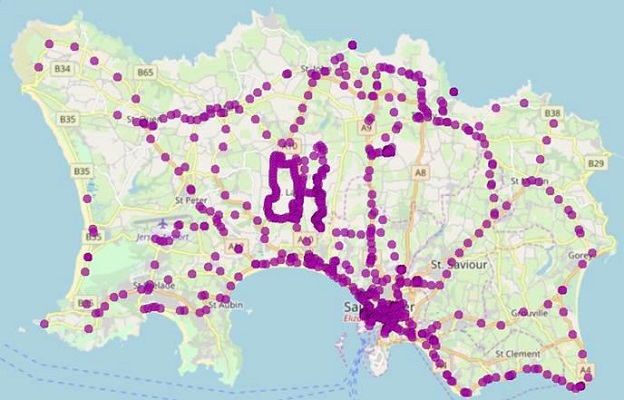 Sony saw the benefit of testing its LPWA technology in Jersey because of the Island’s super-fast fibre network, its varied terrain and the population’s digital connectivity. To demonstrate the potential of the radio technology, JT deployed just two receivers in the central and southern region of the Island. Extensive drive and walk tests were undertaken by Sony Europe’s engineers to confirm the extent of the coverage offered (see below). Hence, the potential low cost of operating a network using this innovative technology. Tom Noel, Managing Director of JT International, said: “Jersey is the perfect location to run new networks . Companies interested in IoT technology can use Jersey as a testbed for their own products and services. The LPWA technology is relatively new but its potential to interact with IoT technology is vast. This will eventually change the way we live, work and do business. Sony’s LPWA technology performed better than expected. So, JT is primed to provide its customers with the best access to IoT technologies and full connectivity. Sony’s LPWA technology is designed for devices that are required to send relatively small amounts of data over long periods of time, using low levels of power. – Collecting data from sensors monitoring water metering, heat regulation or congestion. This would help Jersey businesses conduct operations more efficiently and cost effectively. Whilst also gaining greater insight into trends and behaviour. – Sensors recording temperature, air quality and humidity could give asthma sufferers greater knowledge of their environment. Thus, allowing them to better prepare for the day in order to manage their symptoms. JT is already a global leader in the Internet of Things with over 1.4 million JT SIM cards connecting devices worldwide. This ranges from heart monitors in Canada to payment systems in West Africa.